BestBuzz is a free QR code scanner that lets you scan regular QR codes anywhere and scan BuzzCodes at local places to receive exclusive offers and rewards instantly. Also, share QR codes socially with your friends on Facebook, Twitter, Google+, and Foursquare social media networks. Share QR scans on Facebook, Twitter, Google+, Foursquare, and more! Getting started is simple- download the free app, scan a QR code, and share ones that you like with your friends on social media. You can also search for Buzz QR codes in the Explore Places tab, and scan codes to receive an exclusive offer or reward at participating locations. 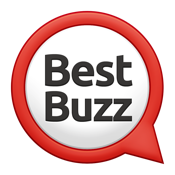 The BestBuzz app lets users explore restaurants, bars, shopping boutiques, spas, salons, and find places to buzz-in by distance, top buzz, or category. When you find a place that is buzz-worthy, you can post tips with reviews and photos about the things you like best!